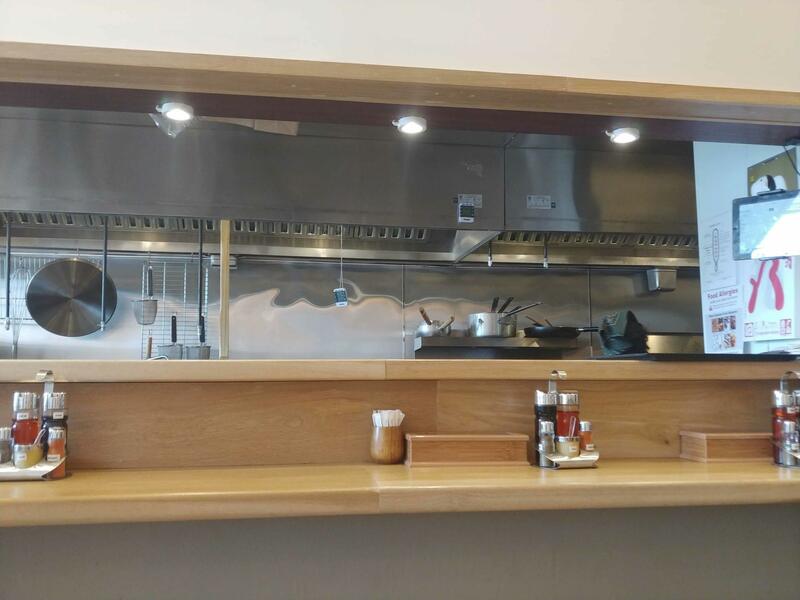 Wooden counter seating overlooks the tiny modern kitchen. 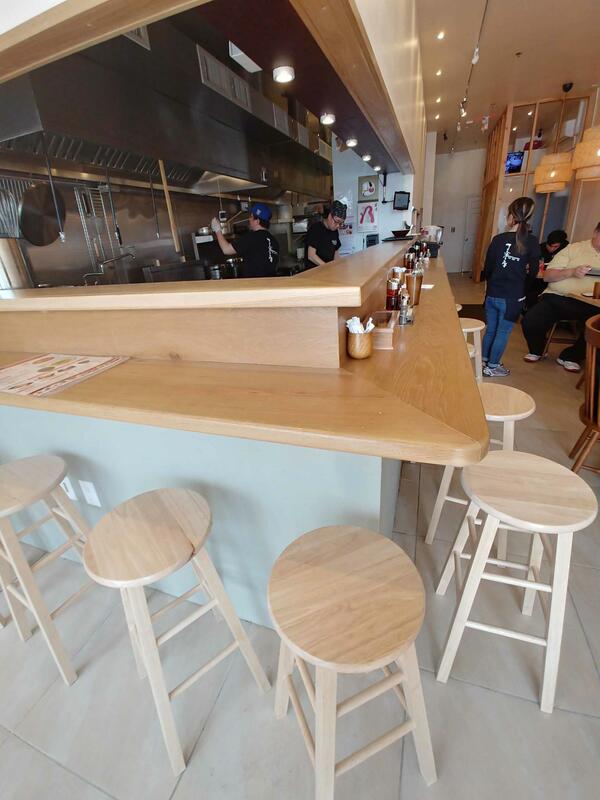 Over the past few years, enthusiastic restaurant owners in various nearby towns have discovered available spaces on the peninsula, where they have opened a second location—New Fu Run and Ippon are clear examples. Great Neck, one of the most culturally diverse towns throughout Long Island, attracts these restaurant owners due to the growing clientele and overall desire for innovative eateries that promote a unique interpretation of classic dishes. With a location in Little Neck, Teinei Ya followed the trend, recently opening a small Japanese ramen bar at 5 South Middle Neck Rd. 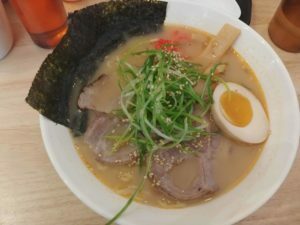 Teinei Ya Ramen’s Great Neck location differs greatly from its Little Neck branch as the Great Neck restaurant specializes only in ramen, while the Little Neck eatery features a more expansive menu with sushi and other entrées. With that said, however, the Great Neck location’s succinct menu allows for greater efficiency in the kitchen. With fewer than 10 options, diners receive their food quickly and chefs prepare their dishes with consistent quality. Teinei Ya Ramen’s decor is stunning and representative of a traditional Japanese ramen bar. The decor is stunning and representative of a traditional Japanese ramen bar: Wooden counter seating overlooks the tiny modern kitchen, elegant wooden chairs face shiny tables topped with a box containing fine chopsticks and silverware, wicker light fixtures hang above each brightly lit table and Teinei Ya Ramen’s innovative logo is displayed throughout. The restaurant stresses the entire dining experience, which is the main reason it has an open kitchen with attentive service. 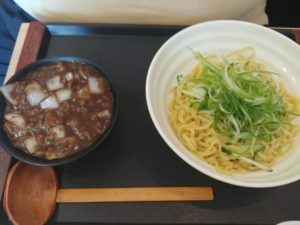 Although the menu includes just six bowls of noodles and four appetizers, Teinei Ya carefully selected its options to include dishes appealing to the individual desires of most customers, each with different ingredients and spice levels. 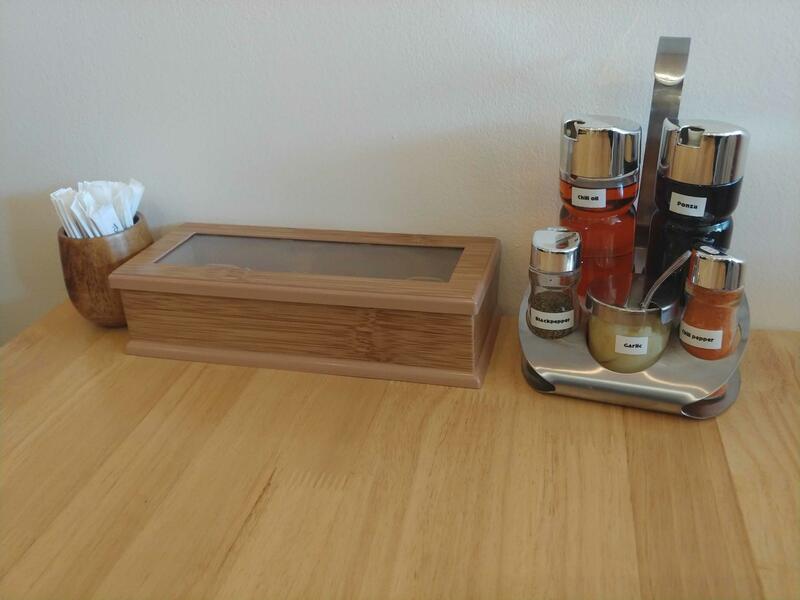 A box containing fine chopsticks and silverware tops each table. Every ramen bowl is ranked on the “richness” of the broth. Using a scale of one to five, with the most popular bowl, the Tonkatsu ramen, containing pork broth and pork shoulder, scoring a ranking of two and a half. Teinei Ya also features Yokohama style ramen made with pork loin and spinach with a richness of four; spicy Tonkatsu ramen with minced pork, sesame ramen and Chinese Szechuan spices; beef tomato stew with beef in a creamy broth; and Zhajiang noodles with soybean paste and minced pork sauce. For each of these noodle bowls, Teinei Ya has selected a corresponding noodle type from the list of thick straight, thick wavy or regular wavy. Tonkatsu ramen soup had a spectacular hearty pork broth accompanied by tender pork shoulder, crunchy bamboo shoots, pickled red ginger, salty seaweed and a braised runny egg. 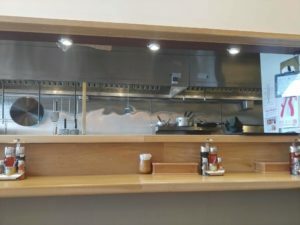 The restaurant has changed its menu around a bit, so options like ramen with edamame falafel have been taken off the main menu, but, rest assured, the dish may be available by special request. Appetizers include pan-fried dumplings, fried chicken, pork bun and house salad. Prices range from $11 to $14 for noodle options and $3 to $6 for appetizers. The Zhajiang noodles were a bit plain with the soybean sauce, which needed more spice, but the scallion and cucumber added a fresh component to a fermented, onion-based dish. Having eaten here twice, I have tried half of the menu options, with each item exceeding my expectations. The dumplings, shaped more like thin rectangles than a traditional Japanese gyoza, were perfectly crispy and not too oily with a delicious pork and vegetable filling. The fried chicken, a staple at casual Japanese ramen bars, had a slight sweetness and tanginess from lemon, and were extremely tender and delicate. The Tonkatsu ramen had a spectacular hearty pork broth accompanied by tender pork shoulder, crunchy bamboo shoots, pickled red ginger, salty seaweed and a braised runny egg. The spicy version of the Tonkatsu featured similar ingredients, but had a stellar spicy pork sauce that increased the flavor contrast of the dish. The Zhajiang noodles were a bit plain with the soybean sauce, which needed more spice, but the scallion and cucumber added a fresh component to a fermented, onion-based dish. 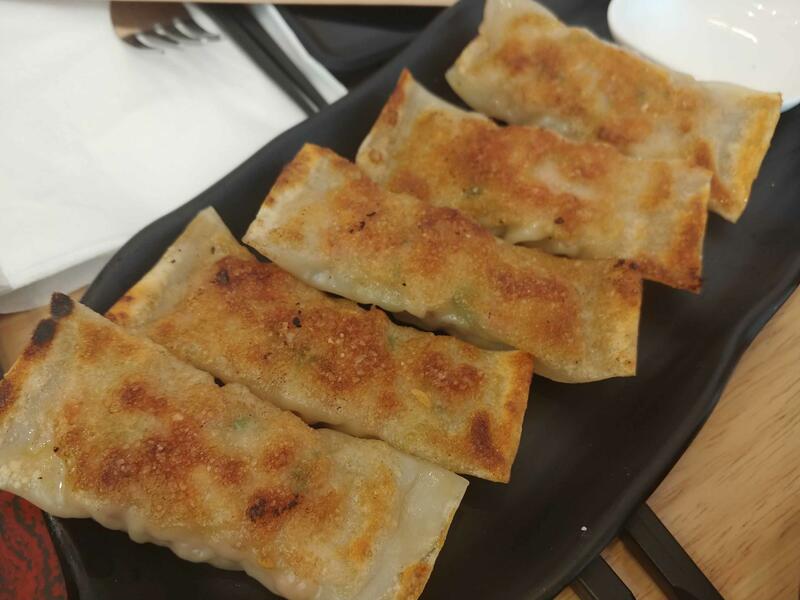 The dumplings, shaped more like thin rectangles than a traditional Japanese gyoza, were perfectly crispy and not too oily with a delicious pork and vegetable filling. Despite its small menu, Teinei Ya captures the essence of an authentic ramen bar, combining concise options with an open kitchen to maintain consistency and provide a full-dining experience in which the restaurant goer is not merely a customer, but also part of the action.